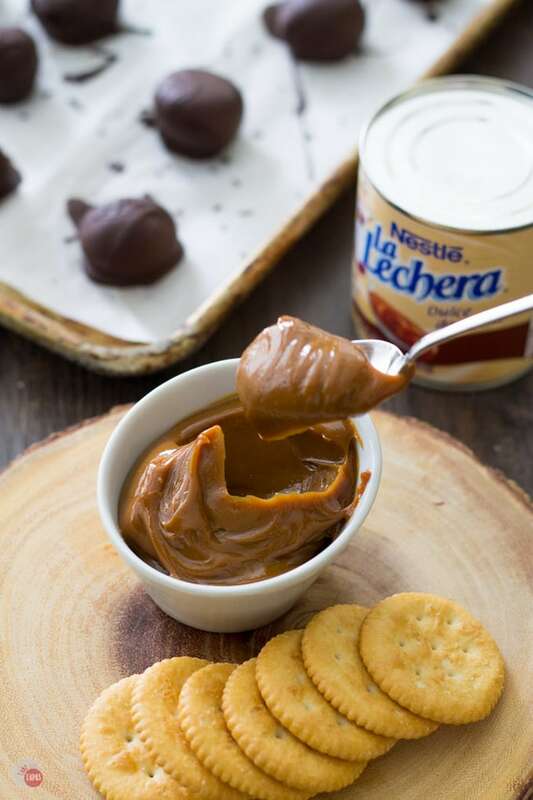 Creamy Dulce de Leche meets a salty cracker and fall in love. They drink to their love with dulce de leche Fireball truffles and swim in some chocolate to complete their date! How can Dulce De Leche save the day? Do you have the same problem I do? 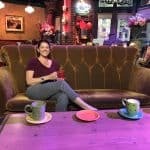 When I ask my husband this he laughs and says, “You have so many problems, you are a going to have to be more specific.” My problem involves my need to balance out flavors. When you eat something salty, do you have to have a bite of something sweet? When you eat something sweet, does your mouth crave a bite of something savory? Right after dinner is over, I reach for a small bite of something sweet. Likewise, when I eat a dessert, I crave a salty bite. And when I binge and eat a whole pack of fun-size candy bars I need a bowl of green beans afterward. If you are a sufferer like me, I have just the solution. And it involves Dulce de Leche. What is Dulce de Leche and where can I get a gallon? Dulce de Leche, or “milk jam,” is a caramel-like cream that can be used for many different things. This distinct ingredient may seem a little daunting to you, but let me ease your mind a bit. Do you remember those delicious caramel creme candies they sell? The tiny discs of buttery caramel surrounding a creme center? I would ride my bike to the corner store when I was younger, seems I was riding my bike everywhere those days, and buy a few packages with the money I had earned from mowing the grass. I would savor the candies by eating the cream out of the center and saving the caramel doughnut for last. That sugary, sweet, buttery, caramel was the perfect treat. Dulce de Leche embodies that same flavor but in a spreadable “jam” that is much more versatile. Who wouldn’t want spreadable caramel? How can you use Dulce de Leche? My go-to use for Dulce de Leche is for dessert. Combining it with other flavors, textures, and fruits are the best way to bring out the caramel flavors. I tend to like some salty flavors in my desserts to balance out the sweet because salt enhances most flavors to make them stronger. Having a dessert that is both salty and sweet with some texture makes it the perfect dessert! 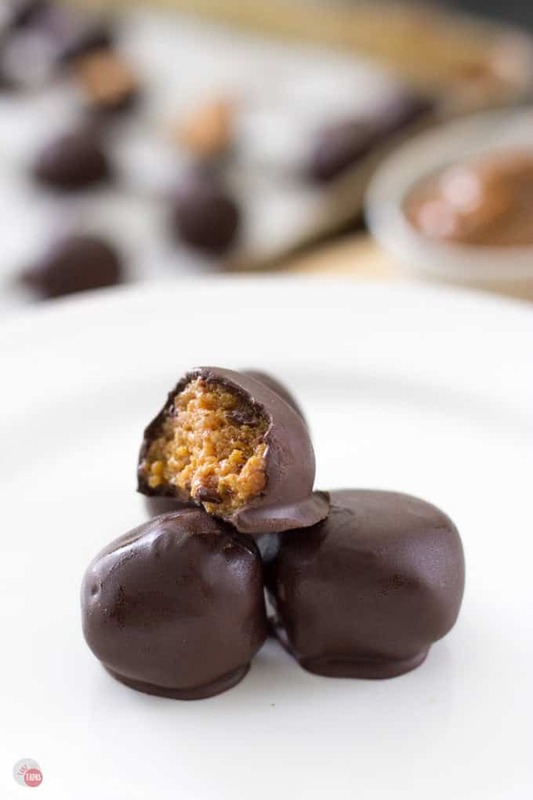 These Dulce de Leche Fireball truffles remind me of my Cracker Truffles with Peanut Butter and Honey. They are also sweet and salty! Dessert is best when it is bite-sized! In my opinion, which most don’t really care about, dessert should be small. It is a way to end the meal with a final bite, or two, and send you on your way. I was never into desserts that are bigger than your entree, even though I have devoured half a cheesecake but that was my actual dinner and not dessert. But we are not going to talk about that anymore. Why do we need pieces of cake that are literally 1/4 of the whole cake? Or an ice cream sundae with 4 scoops of ice cream? We don’t! I just need one bite to balance out my dining experience. 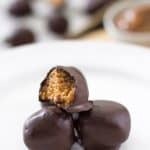 My Dulce de Leche Fireball Truffles are that one bite! The perfect combination of salty and sweet with a hint of booze! 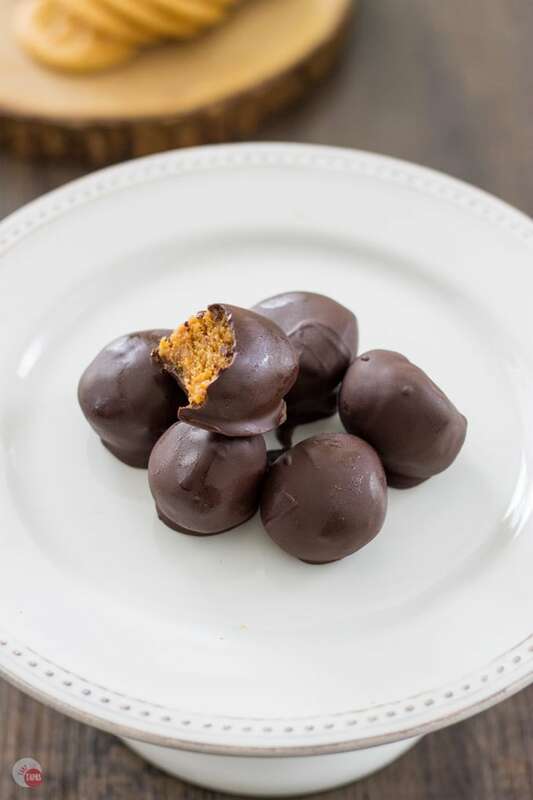 These Dulce de Leche Fireball Truffles were born after taking a spoon, dipping it into the Dulce de Leche, tasting it, and then thinking this would be good spread on a salty cracker. The flaky, buttery cracker with a hint of salt, balanced with the sweet and creamy dulce de leche sent my head spinning. A bit messy to eat so I felt the need to repackage it. Packaged in dark chocolate is the best way to eat anything really. Maybe not steak but I won’t rule it out, just yet. The result of that experiment is these delicious Dulce De Leche Fireball Truffles! Enjoy one after your dinner! Creamy Dulce de Leche meets a salty cracker and fall in love. They drink to their love with Fireball whiskey and take a swim in some chocolate! 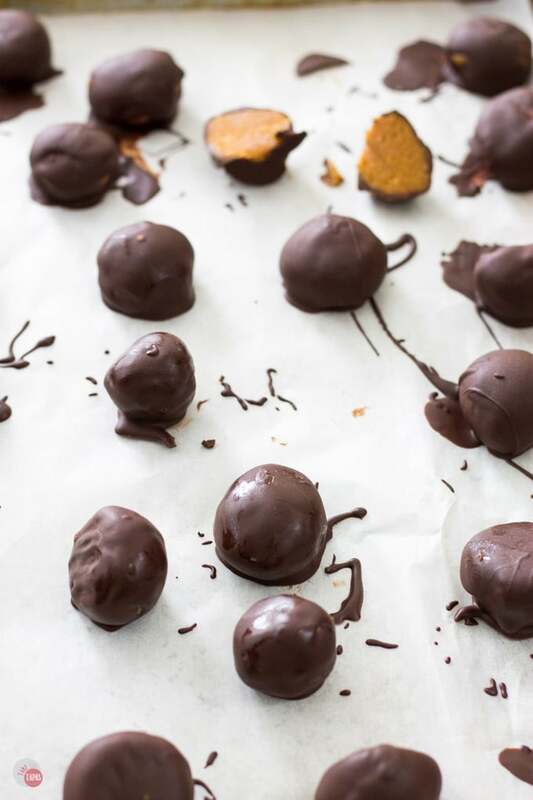 These Dulce de Leche Fireball Truffles are something that you need to make tonight! Crush the crackers and place in a food processor. I crushed ahead of time because the crackers will slide under the blade leaving a few large pieces. Add the Dulce de Leche. Add the Fireball whiskey and pulse again until a thick batter is made. Scoop out into individual truffles onto a parchment-lined baking sheet or platter. Place in freezer to harden. Approximately 20 minutes. Melt chocolate and coconut oil over a pot of simmering water using the double boiler method. 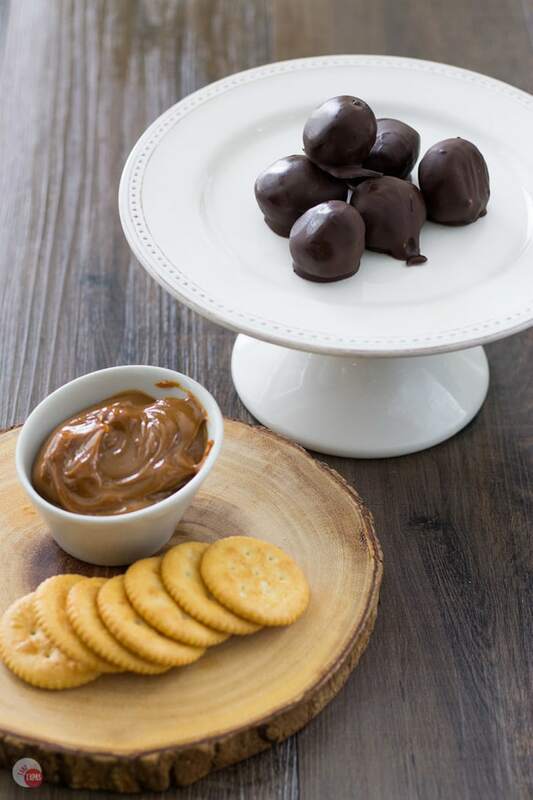 Remove your truffles from the freezer and dip in the chocolate one at a time to coat. Place dipped truffle back on the parchment-lined baking sheet and place them in fridge to set the chocolate. Approximately 10 minutes. Keep stored in the fridge until ready to eat. These Truffles look Awesome. I am definitely making these for my next family get together. Im really enjoying your truffle series! Im especially fond of these…. they will be making an appearance at a cocktail party at my house very soon! Thanks Michele! I didn’t really try to do a series of truffles but I just couldn’t quit making them!! And eating them! Yes! I totally need sweet and salty to be together. LOVE that these have fireball in them, what a cool twist! Or hot twist? Sorry. I could eat these right now. I absolutely love chocolate that has a hint of salt about it and a touch of whisky you say? What’s a truffle without a nip of alcohol. That’s what I say. I’m sorely tempted to get my bike out and ride around the block just so I can feel I’ve legitimately earned these truffles. Then I could sit back and stuff my face with them all afternoon. Truffles are a holiday season tradition for us! I can’t wait to start our truffle making and I definitely want to make these too 🙂 LOVE the salty sweet combination! Great way to use those crackers! My son Evan and I made truffles every year for Christmas gifts… One of the most-missed aspects of leaving New Mexico! This would be an awesome addition to our line up! Yes, sweet, salty, and spicy is a favorite combination for sure! I hope you guys enjoy making them Tamara! These truffles look delicious! I like sweet and salty and spicy. It’s about the experience right? More than just chewing and swallowing, I have to try very hard not to dip that spoon in the dulce de leche or it will never make it into a recipe! Your video was awesome! Thank you Julie, I did enjoy eating it with a spoon too! Luckily I didn’t have to use the whole can! About this time last year I went to Patagonia to participate on a penguin research project. During my time there it was very clear that the Argentineans have a deep love for Dulce de leche. It was everywhere. . .sandwiched between two cookies. . .stuffed into profiteroles. . .and liberally spooned into coffee. These truffles are bringing back so many memories of this trip. And the fireball whiskey. . .such a unique and unexpected addition. I bet it tastes absolutely divine in these truffles. And you have inspired me to give it a try in other sweets for an added kick.. Thanks Lynn! I love adding a hint of spice to sweet things to change it up a bit. Fireball is my new obsession even though I recently started liking cinnamon again. I have never tried it in coffee before because I am not a coffee drinker but I am a tea drinker so I might have to try that! These are going to be amazing for the holidays! I love the unique flavor combinations going on! I suffer from the same issue as you…something savory and then something sweet….well then something salty. I love this idea… One bite solution. Perfect to make for the holidays! I love adding a bit of heat to sweet and salty treats. These treats look very pretty too!